On Halloween the Turtles decide to investigate a weird house they’ve been hearing about. Evidently, monsters live there and have been stealing the candy from trick-or-treaters all night. The Turtles ring the doorbell and are roared at by Count Dracula, the Wolf Man, the Mummy and the Frankenstein monster. The monsters steal their bags of candy and slam the door, however, the Turtles recognize their voices. 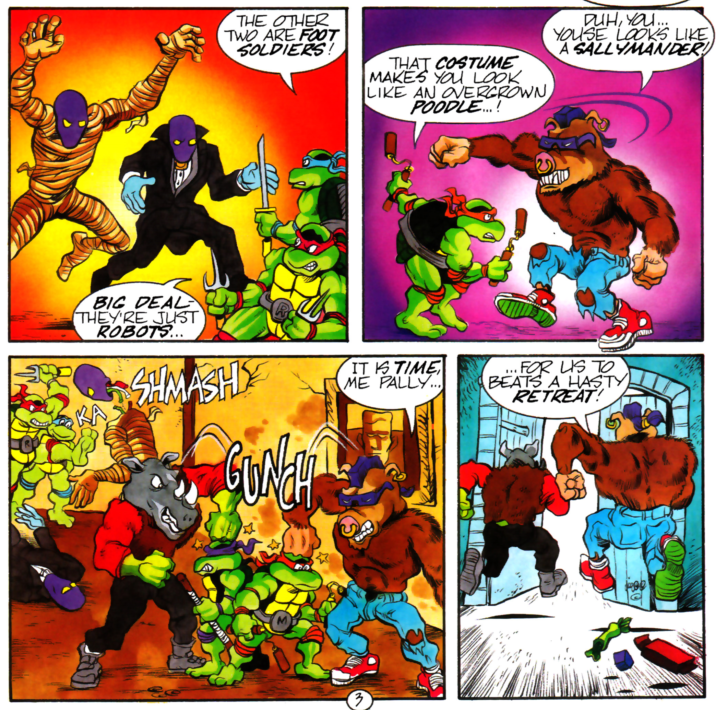 They kick in the door and discover that the Wolf Man and Frankenstein are none other than Bebop and Rocksteady, cleverly using the disguises to purloin candy. The Turtles attack, but the Mummy and Count Dracula are revealed to be Foot Soldiers. While they’re busy dismantling the robots, Bebop and Rocksteady beat a hasty retreat. They don’t make it past the front yard before they’re halted by REAL monsters. The two mutants promptly faint and drop their bags of stolen candy. The Turtles catch up with them and wonder what could have been scary enough to make the evil thugs pass out. Not far away, a gang of little kids in monster costumes recover their stolen candy. 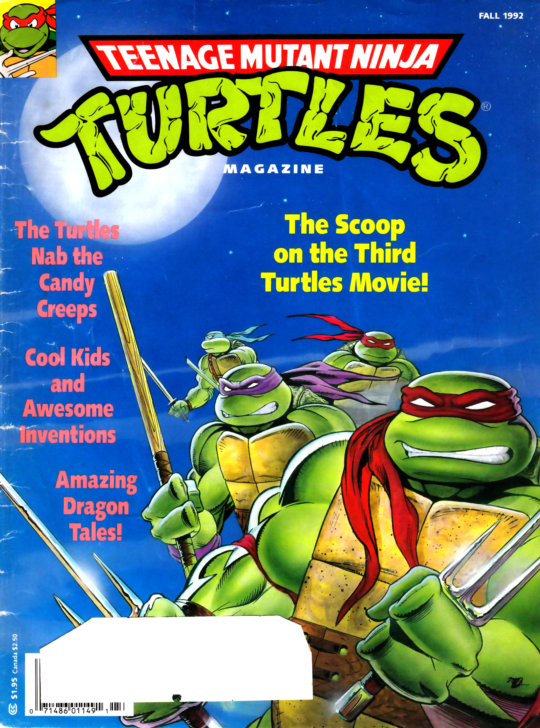 *This story is continued from TMNT Magazine (Welsh) #9. The story continues in TMNT Magazine (Welsh) #11. You know, if I was actually any good at paying attention to the calendar and reviewing seasonal stories on time, I might have done this comic on Halloween instead of Christmas. Ah well. Anyhow, here’s another of the “Bebop and Rocksteady are inconveniencing everybody” comic strips that dot the back end of Welsh’s TMNT Magazine. I love how utterly smalltime this story is; I genuinely believe that stealing candy from children is something Bebop and Rocksteady would stoop low enough to. Yeah, the ending is dumb but so are all these comics; it’s the situation that’s really amusing. Not just that, but the fact that they apparently appropriated two Foot Soldiers from the Shredder to aid them in their rascally scheme. There’s also the matter of Bebop and Rocksteady having to wear rubber disguises to scare people; like their mutant faces wouldn’t be frightening to little children. But then, if any of the people in this TMNT universe watch April O’Neil’s nightly news reports, and witness the near daily defeats of Bebop and Rocksteady, I can understand why no one would find those two the least bit frightening. "The two mutants promptly faint and drop their bags of stolen candy." But Bebop and Rocksteady don't appear to be holding any candy.